When describing a video signal, professionals are very detailed. They ensure specificity because video files cannot be easily resized. As such, they accurately describe the frame size and the frame rate so the footage matches the technical needs of the person commissioning the content. 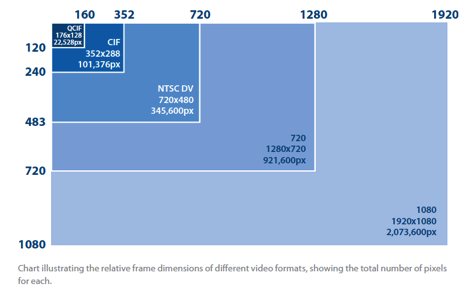 The amount of information in each video frame is typically referred to as its frame size (but it can also be described as the image resolution). It refers to the pixel dimension of the video signal. This is the greatest factor in the image quality of the video. If all other conditions are equal (lighting, composition, etc. ), a higher resolution results in a better quality image. When you work with video files you need to specify a frame size for the captured video file. This is very similar to the image size when working with photos. There are typically three choices when working with video files. The top size is one used by the RED camera, and is useful for motion picture production. The next two sizes are both considered high definition video, which has become the preferred option in video production. High definition (HD) video has two standard frame sizes so video cameras, software and display can all work together. Many DSLR cameras support multiple frame sizes, thus allowing you to choose between 1080 and 720 on the same camera. 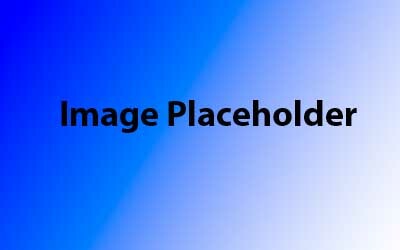 The term aspect ratio is used to describe the ratio of width to height of an image or clip. When discussing video, you’ll often see aspect ratio specified in one of two ways: using whole numbers like 16 x 9 or in a decimal ratio such as 1.78:1. Figure 2 When the live view on the back of the DSLR camera shows a ghosted area like this, be aware that it is not part of the shot. Unlike photography, it is not possible to crop a video shot after shooting without a significant loss in visual quality. Special care should be given to composing a shot. Figure 3 These individual images, captured in quick succession and a constant interval, will be seen as one smooth motion. Video works because of a concept called “persistence of vision”. This describes how the human brain can connect a rapidly shown-series of still images to perceive smooth motion. When describing video, this frame rate is measured in seconds (and may contain a decimal value). Note that, in some cases, whole frames are split in half and delivered using fields, where the odd (or even) lines load first, then the second half of the image loads afterwards. This concept is called interlacing, and is used in many broadcast environments. 60 fps (59.94 fps): Standard frame rate for 720p HD used in the United States and other countries using the NTSC (National Television System Committee) set of video standards. 50 fps: Standard frame rate for 720p HD used in Europe and other countries using the PAL (Phase Alternating Line)set of standards. 25 fps: The common frame rate of video used in Europe and additional markets around the world that are based on the PAL standard. 24 fps (23.98 fps): A rate that closely matches that of motion picture film. Fractional frame rates (like 29.97) come into play in countries like the United States that follow standards set by the NTSC. Originally, the video frame rate in the United States was 30 fps (or a field rate of 1/60 of a second). This rate was used to match the 60 Hz AC power-line frequencies in North America. When color was introduced into the video signal in the 1950s, the rate had to be changed. To make color work properly with an existing transmission and hardware infrastructure, engineers had to slow down video frame rate signals by 0.1 %, leading to a frame rate of 29.97 frames per second (or a field rate of 59.94 fields per second). For compatibility with standard definition televisions, the same logic has been applied to HD formats in countries that were based on NTSC standards. For footage that mimics motion picture film, a good choice is to record 24 (23.98) fps. This is also an ideal frame rate for productions to be delivered by DVD, Blu-ray or the Internet. For footage that will be used for broadcast, 30 (29.97) fps is a good choice for interlaced 1920 x 1080 material in NTSC-based countries. If you’re working with the PAL standard, you’ll use 25 fps for 1920 x 1080 material. For footage shot 1280 x 720, the best choices for broadcast are 60 (59.94) fps in NTSC based countries and 50 fps for PAL countries. At this time, most DSLR cameras only shoot progressive frame rates. This is largely due to the sensor types used in the cameras. Computers and computer monitors as well as portable media players and smart phones are inherently progressive, but television broadcasting is based on interlaced techniques and standards. For computer and device playback, progressive offers faster decoding and better compression than interlaced and should be used if possible. In NTSC formats, the frame/field rate is actually 0.1% lower than listed, so 24P is really 23.976 frames per second, and 60i is really 59.94 fields per second. PAL formats use the listed frame rate — 25p is really 25 frames per second. Video works by the rapid display of several, sequential images. The two major methods of scanning or displaying a video signal are referred to as “interlaced” and “progressive”. Interlaced scanning was introduced to the television signal in the early days of transmission standards. It was an effective way to offset the decay or loss of brightness in phosphors that were in use in cathode ray tubes (CRTs) that were in use. Interlaced scanning allowed for a near constant brightness of the image to be maintained. Scan lines or horizontal lines of pixels (called fields when grouped together) load in an alternating fashion in an interlaced signal. Each line is scanned very quickly: For example, most broadcast television in the United States has a frame rate of 29.97 frames per second, so each field is scanned in at 1/59.94 of a second. Adding both fields together produces one complete frame. Even though DSLRs shoot using progressive scanning at some point, it’s a good bet that your footage might be shown on an interlaced system. Progressive scanning scans all the lines in order, starting at the top of the screen and moving toward the bottom. Progressive scan devices include some televisions, most computer monitors, film projection, smart phones, and even the LCD on your DSLR camera. Broadcast television with a frame size of 1280 x 720 uses progressive scanning. Although both interlaced and progressive formats are available for 1920 x 1080 HD video, no interlacing exists for the 1280 x 720 HD format. With so many different attributes needed to describe a video file accurately, a series of technical shorthand has been developed. You might have seen technical notations such as 1080i60 or 720p60 used to describe a video file. For example, 720 60p means a frame that is 1280 x 720 pixels and 60 progressive frames per second. For interlaced formats, the number preceding the i refers to fields. For example, 1080 60i means a frame that measures 1920 x 1080 pixels and scans 60 interlaced fields per second. The 720 formats all are progressive, but the 1080 formats have a mixture of progressive and interlaced frame types.